Please help a newbie by recommending the correct router bit shape. Here's some background about the project. Mom has several doors in her house that rotted. It seems that whoever assembled the doors did not paint the edges of the door slabs, and the doors did not hold up to the weather on the gulf coast. Most of the doors that have the problem are fixed French patio doors. They do not move but look exactly like the few doors that do move. For this reason, we feel the they can be repaired without too much worry since these fixed doors will not swing at all. These painted exterior doors are 30 years old and were made by a company that is no longer in business. Each door has thin rails and stiles with one double glass pane. We've repaired a couple of doors just by using 8/4 fir boards to replace the rotted bottom and top rails. While dowels have been sufficient, we would really prefer to find a router bit with 1/2" shank to make the nice grooves that the original doors had in addition to dowels. 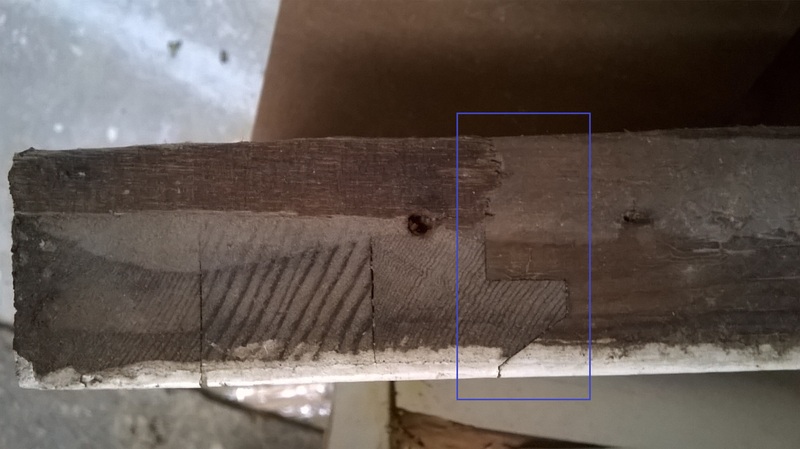 The photo shows the door slab viewed from the top so you can see the joint (highlighted by the blue box) between the rail and stile. We can't seem to find the same bit that the door manufacturer used. We're new at this and don't know which other styles of bits can be used. Can anyone tell which router bit is acceptable for joining rails and stiles of this thickness? Would it be a finger-joint bit? Is there instead a rail and stile bit for this wood thickness (1.75" actual thickness)? Now that you see the joint between the rail and stile, do you think the dowels are enough and perhaps the groove is unnecessary? I could be wrong, but I don't think you'll find a router bit to duplicate that entire cut. Looks like you'll need a custom moulding head. Too big for a router, you need a shaper. Door manufacturers do not use router bits. You will have use your abilities to make do. Custom profiles for router bits can be made by several advertisers within inches of these words. What is your budget for the doors - time and materials? Thank you, JeffM, rich c, D Brown, and David Sochar, for your responses. Mr. Sochar asked a question about the budget and materials. Since the doors are not readily available for purchase, we've been spending a week or more on each door when using wood dowels to join the rails and stiles. Also, we've been putting around $110 worth of new wood, including red oak for sills and douglas fir for the new jambs. At one time we repaired the slabs with Spanish cedar, but it was expensive at $8 per board foot, so now we buy rough-sawn fir from a lumberyard about an hour's drive from here. Then we fill the knots with epoxy, plane the board, sand it, coat with shellac to prevent resin from coming through, then we paint it. The fir is less that $3 per board foot, so the red oak (~$7 per board foot) is still the most expensive part. Do you think the wood dowels will be enough to join rails and stiles? Getting the pieces perfectly flush before gluing is a real challenge. Any advice? I would use white oak rather than red. More rot resistant! $7/bd ft,!! Way more than we pay. Notice that the doors were stave core and thick veneered. Usually helps with warpage/cupping on exterior doors. With a little care you can do those cuts on a table saw. In my shop we would produce the lineal cuts on the molder and the copes on a shaper. Lots of doors are made with 5/8" dowels. You might be able to use a router table for all the cuts but it will take quite a few passes and require making a jig for the copes. I'm guessing you don't have a power feed so your cuts will be less than ideal but that's what sand paper is made for, right? Clamp the parts together, dry, and through drill the dowel holes. There are exterior door router sets to be had. You need a beefy router in a table to use them. Infinity, Freud, Whiteside, etc. all have them. Just search for "Entry & Interior Door Router Bit System". say productive only in that while the members there, many are professional/commercial and all sorts of others will simply have more available time to go back and forth and discuss your issues, since you say you are learning. There are of course domestic U.S. forums also to post on. Feel free to send me a PM if you wish to discuss. Check Whiteside router bits, download their catalog. Marc, I may have a solution for you. Whiteside for example has the same profile bit set but the proportions won't match as they are for ¾" or 1" stock. Save the expense and labor of trying to match and cut router bits, particularly since the doors won't be opening. I have used RSS structural screws for a half dozen such doors I made for use as patio architectural gates/doors. Google GRK fasteners, RSS structural screws (#30 bit), and they are carried at Lowes, Depot, and other fine concessionaires. Use a 5/16" x about 6" or 7" drilled and countersunk from the side edge. You can then countersink a &#8541;" or 3/4" head and fill it with a piece of dowell rod cut as plugs. Far easier than the routed attempt. I'm a little slow this morning to try to take and upload pics but if you want them I will., if ? let me know.